Spring is here! The days are getting longer and the streets have been swept clean as motorcycles and classic cars take to the roads once again. During this time of the year it is quite easy to leave the cares of winter behind, especially if the season was a long and harsh one. Although we would like to forget about winter, it is important not to lose sight of vehicle maintenance. When it comes to vehicle maintenance this time of the year is a great opportunity to assess all onboard equipment, the overall condition of a vehicle, and perform preventative maintenance (PM) as needed. The ideal starting point in assessing any vehicle, whether it is a fire truck, bus, over the road tractor, or your own personal vehicle is to wash it. Washing a vehicle clean helps to get an overall picture as to the condition of the body and chassis of the vehicle, spot any leaks, and identify any areas that made need repair. All grease points on the chassis should be lubed and the tires and brake system checked. Additionally, a thorough inspection of the engine, transmission, and driveline should be done as well. All fluids/ filters, belts, and hoses should be checked and/or changed to help maintain proper operation of these systems. Lastly, any vehicle specific equipment should be inspected as well. For example, a fire truck should have a pump and ladder test, a plow truck’s hydraulics should be tested, and an over the road tractor’s fifth wheel should be inspected to ensure that everything is working properly. 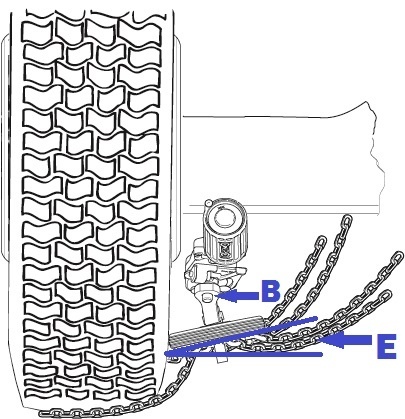 Option #1 is to simply leave the chain system on the vehicle. While this is obviously the easiest of the three options it still requires the chain system to be checked every time the vehicle is brought in for a PM. When servicing the system in this manner, the chain wheels need to spin freely (Fig. 2 A.) with no binding and the chain plates and wheel hubs need to be checked for excessive wear. Next, the arm pivot points (Fig. 1 B.) need to be checked for play and replaced or greased. Finally the system needs to be engaged and disengaged to ensure all parts move freely, the solenoid is working, and the chain wheels are operating at the proper angles (Fig 1 E.). In fact, when choosing to leave the system on year round it needs to be engaged and disengaged at least once a month if not more to keep the system “exercised”. Option #2 is to remove only the chain wheels from the system. Again although simple in practice this option can go a long way in prolonging the life of the system. The reason is that when you remove the chain wheels you are not only removing the wheels themselves, but also the 10-12 lbs. of weight associated with the wheels. This reduction in weight at the end of the arm contributes to prolonging the life of the arm bearings and angle joints. After the chain wheels are off they should be marked with the truck number (and left or right if using directional chain) before putting them on the shelf. Finally, power to the system should be disconnected or the in cab switch should be locked out so that the system is not accidently engaged. Option #3 (the best course of action) is to remove the chain units altogether leaving only the mounting brackets (attached to the suspension of the truck) in place. When the chain units are completely off the vehicle it allows for a thorough evaluation of the system. The chain units can be “benched” by placing one side at a time in a vise and putting air to the unit. This allows the system to articulate through its full range of motion all the while checking for any abnormal wear, or erratic movement. At this point any worn parts can be identified and replaced and all pivot points can be greased. Best of all, once the system is refurbished or found to be acceptable it is placed on a shelf in the shop awaiting the start of the winter season, but for now let’s enjoy spring. Customer satisfaction is important to us at Onspot which is why we offer driver and maintenance training as well as fleet reviews. Please contact your regional sales representative for more details.